Cars could be banned from George Street as part of proposals revealed to transform the New Town into a “world class space” for pedestrians. The draft plans for George Street, Hanover Street, Frederick Street and Castle Street could see “plazas” and dedicated cycle routes created, as well as a vision for an “enhanced pedestrian space”. Artist's impressions show a pedestrian-friendly George Street. The George Street concept includes a specific proposal to consider “the restriction of vehicle access” to business waste collections and deliveries and restrictions on “access hours to key times of day to reduce vehicle dominance”. The bus network is not mentioned in the draft proposals and the future of public transport is expected to be set out in the council’s city centre transformation project. The draft design for the George Street and New Town (GNT) project has been produced following extensive consultation including with community and specialist interest groups. Cllr Lesley Macinnes, transport and environment convener, said: “The GNT project is widely recognised as a crucial catalyst to re-invigorating George Street and adjoining New Town streets for the present day but is also fundamental to ensuring the area can easily adapt in the future as the city of Edinburgh continues to evolve. “The concept design aims to create a world-class space that respects and enhances the World Heritage Site. It seeks to make the First New Town a safer and more vibrant area by opening up central places to more people and enhancing the current setting and position of the street’s statues to make greater feature points of them. The council’s ambition is for George Street to be “on par with other great global cities” by giving more focus to pedestrians. Significantly more outdoor seating could be made available, while the central car parking space could disappear – which the council says “detracts from the character and heritage of the street”. Other proposals include prioritising blue badge parking on George Street, with residents and pay and display parking moved to side streets. More trees could be planted along George Street while “dedicated delivery and servicing areas” could be created. If approved, pavements could be widened to “enhance the pedestrian experience, accessibility and movement flow” along George Street. Opposition councillors have welcomed a plan to overhaul George Street. Conservatives called on the authority to stick to any agreed plans for the New Town when proposals for the entire city’s transport network are agreed next year. Conservative transport spokesman, Cllr Nick Cook, said: “The potential for George Street to provide a world class public space are still recognised by many – despite the council’s previously botched attempts at redesign. “It is essential that residents and business engage with these new plans to ensure they are compatible with business needs and do not impede the lifestyles of local residents who live in our vibrant city centre. Green councillors welcomed the draft proposals putting more emphasis on active travel. Cllr Claire Miller, who represents the city centre, said: “It’s clear to me that a redesign of George Street is long overdue. “Residents will be looking for high quality designs that are in-keeping with the heritage and atmosphere of George Street, unlike the previous trials of wooden decking and shacks which were badly received. The council will hold drop-in sessions at the fifth floor of the City Art Centre, from 2pm to 7pm today, between 11am and 5pm tomorrow and from 10am to 4pm on Saturday. Transport and environment vice convener, Cllr Karen Doran, said: “The project team welcomes people’s feedback on the initial concept design which is a major step forward in the project’s development. Following the public consultation, final proposals will be agreed by the council’s transport and environment committee next year. Earlier this year, the council launched proposals to overhaul how people move around the city – and is currently asking the public for their views on its transformation project, a document, called ‘Connecting our cities, transforming our places’. One of three options put forward by the city council says “key streets could be pedestrianised” while hubs are built for buses to drop off passengers to use “less impactful transport”. It is not yet clear whether buses would be able to travel through the city centre. A less radical option that has been put to the public includes a “business as usual approach” although the Scottish Government is requiring the council to establish a Low Emission Zone. The third option is a “strategic approach” which highlights possible “controls on the levels of general traffic with restrictions on through traffic within certain areas”. 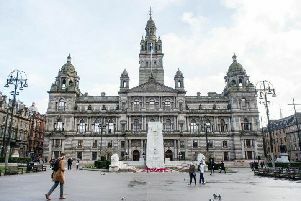 Councillors have also voted for the Capital to become the first place in Scotland to introduce city centre car-free zones once a month. A pilot project that will see key roads closed to traffic on the first Sunday of every month between 10am and 5pm was agreed in August. No decision has been taken on which roads will be closed during the Open Streets programme, but they will include “key parts of the city centre and town centres” across the Capital such as Portobello, Stockbridge and Corstorphine. The first Open Streets events could take place early next year if agreed by councillors.